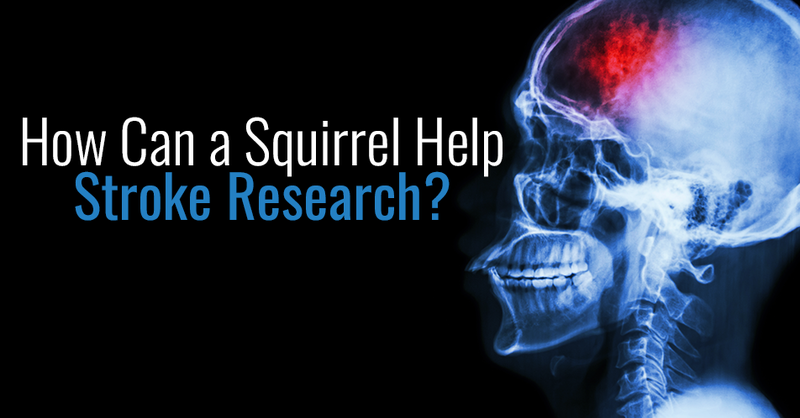 How Can a Squirrel Help Stroke Research? About 800,000 Americans experience a stroke each year, and about 90 percent of those are ischemic strokes. Ischemic stroke occurs when blood flow to the brain stops. This usually results from a “clot” blocking blood flow in a blood vessel. As your brain requires about 20 percent of the blood flow from the heart to function, an acute stoppage of blood flow causes the brain cells to quickly die. It only takes about two to five minutes for this process to occur. Your brain is a somewhat unique organ in that once a brain cell dies, it cannot regenerate. This is completely different than other body parts like your skin, which can quickly and easily regenerate itself once injured. Therefore the deleterious effects of stroke are permanent. Tremendous research is constantly ongoing to prevent and treat strokes. Currently, the only way to treat a stroke and minimize stroke symptoms is to get blood flow back to the brain as soon as possible. Once medical attention is sought, stroke victims are given blood thinners, which attempt to thin the blood so it can circulate around the clot and get more blood flow to the brain. If the ischemic stroke is identified quickly enough, a medication called tPA can be given to dissolve the blood clot. Usually, intravenous tPA can be given up to three to 4.5 hours after symptoms are present and intra-arterial tPA can be given up to about six hours. Sophisticated surgical devices which may physically remove the blood clot can be used up to eight hours. 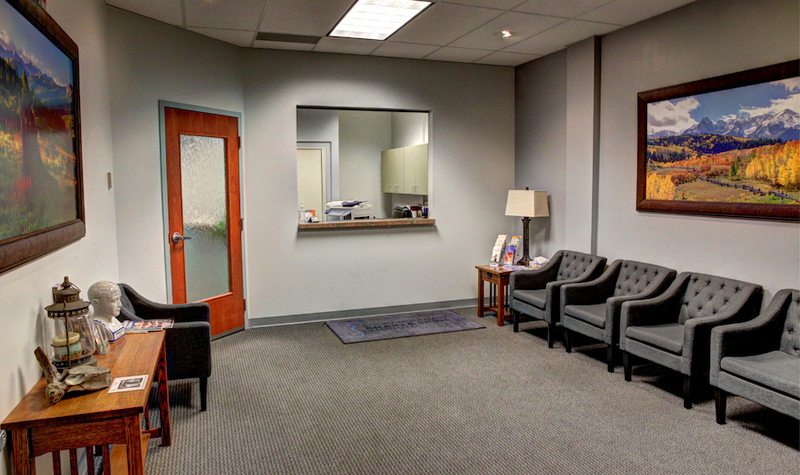 In the end, the greatest limitation to the treatment of ischemic stroke is the time it takes to identify a stroke and then start treatment in the midst of brain cells dying. The future of ischemic stroke research is to find ways to reduce cell death while they are not getting adequate blood flow and nutrients. Essentially, make the brain cells more tolerant of limited blood flow. An interesting model for this is the hibernating ground squirrel. Ground squirrels can dramatically reduce blood flow to their brains during hibernation, just like people during strokes. 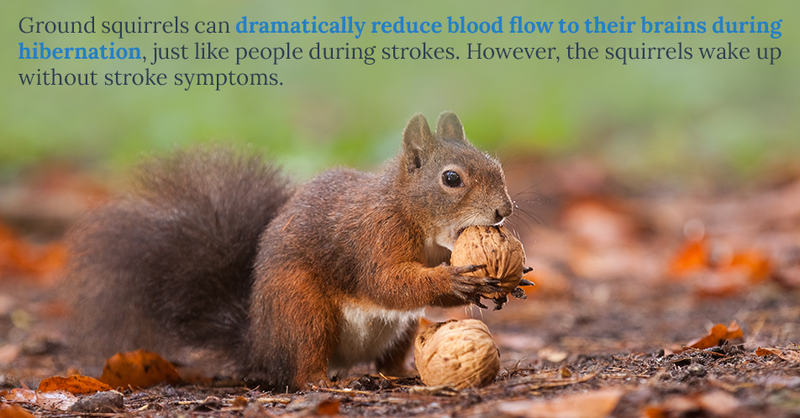 However, the squirrels wake up without stroke symptoms. Ground squirrels have a mechanism in their brains which allows their brain cells to tolerate ischemia. During hibernation, whole body metabolism drops to a fraction of its normal level. In this process, there is a profound reduction in blood flow to the brain. In response, they have a marked elevation of certain proteins in their brains, which may protect cells and keep them alive while they cannot get nutrients. This is called cytoprotection. It’s been discovered that an injection in rodents may be able to mimic this process, and therefore its possible a similar injection could be developed for humans and incur similar protection during a stroke. While such an injectable medication does not exist yet, it may be available in the future. PreviousPrevious post:The Art of BendingNextNext post:Can Our Brains Grow? Does Mark Twain Know?